← Sermon: Acts – Explain Yourself! 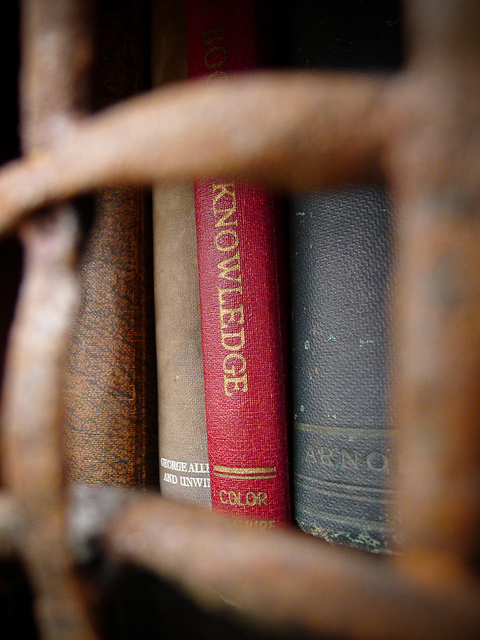 Knowledge by Jean-Jacques Halans on Flickr. Some rights reserved. ‘We Know More Than Our Pastors’. That was the title of an article written ten years ago by a former pastor who argued that Christian participants in the emerging world of social media on the Internet (at that time, largely confined to blogging) had a greater reach and a greater access to knowledge than the typical church minister. Actually, ‘we know more than our pastors’ isn’t a recent phenomenon. There have been many occasions in church history when new vision has come not from the centre but the margins of the Christian community. And we have one such example in today’s reading. We have spent the last few weeks caught up in the apostle Peter’s agonies over taking the Gospel beyond the Jewish community to Cornelius the Gentile Roman centurion. But today we discover that some anonymous disciples had shared the Good News of Jesus with Gentiles before he had! Stephen is killed in chapter seven, and the persecution breaks out in chapter eight – all before Peter is challenged to visit Cornelius. So-called ‘ordinary Christians’ are miles ahead of the apostle here. When that happens in our religious institutions today, the common instinct is to come up with a set of rules, many of which are about prohibitions to make sure such messy and disorderly behaviour doesn’t occur again. But thankfully, the reaction of the early church was positive. It recognised a work of God. And rather than trap people with regulations and tie them up with red tape, the dominant tone of our reading is encouragement. And encouragement is a vital quality when it comes to Christian mission. Which makes this an appropriate reading for a service I am sharing with the church Mission Team. I think it’s fair to say that most of what our Mission Team doesn’t so much involve us in direct mission, but in encouraging others who are involved in mission. That isn’t to say we should use that as a cover for not engaging in mission ourselves, but it is to say we need to draw attention to the importance of encouragement in the sustaining of Christian mission. 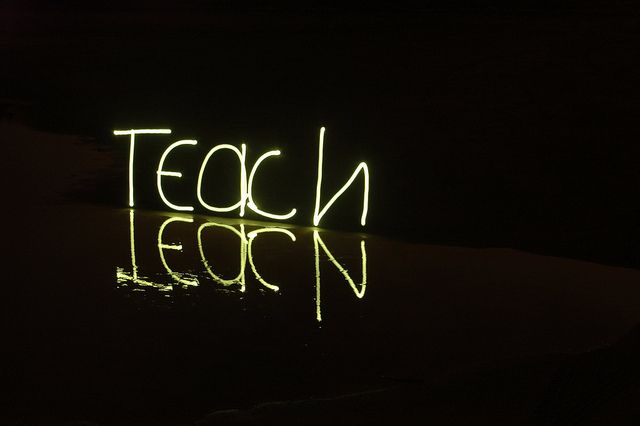 Teach/Learn by Duane Schoon on Flickr. Some rights reserved. After all, what are we about as a church if we are not about making new disciples of Jesus Christ and growing in our discipleship? It’s why the teaching ministry is so vital – whether from the pulpit, in the home group, or one on one as mature individual Christians teach newer Christians how to walk closely with Christ. This teaching ministry takes precedence over institutional requirements, administration, socialising, and all sorts of other areas. If our church is doing too many things to squeeze this in, then we need to look at our priorities. Furthermore, it needs to be a priority among ordinary Christians. Each one of us ought to be able to answer questions such as these: what have I done in the last twelve months in order to be more like Jesus? How have I changed? (Granted, that one might better be answered by those who know us well.) What am I doing in my life right now that is an intentional step in learning the way of Christ? If this is so important and I am not doing it, what will I give up in order to focus on being more Christ-like? What trade-off will I accept? What sacrifice will I make? Have I filled my mind with too much trivia? In terms of the wider mission of God’s church, this is why we release church leaders such as ministers to go to areas of the country and of the world where there are new disciples of Jesus. Help is needed to establish new converts in the faith. It’s something we can support when we give to World Mission or Mission In Britain, and when we pray for it. 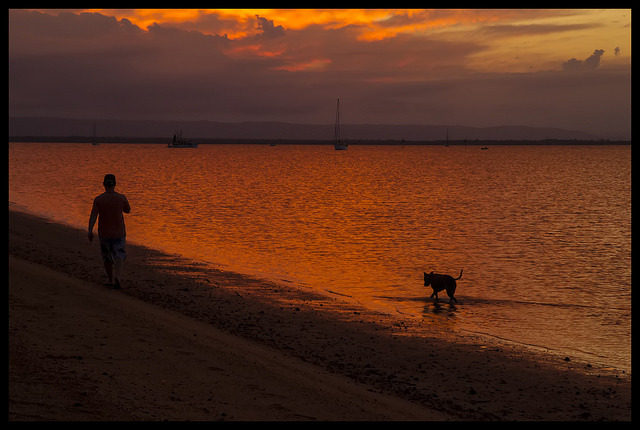 Following the leader in sunset reflection by John on Flickr. Some rights reserved. Secondly, encouragement is needed in the development of new leaders. Saul still isn’t Paul. He may have begun preaching soon after his conversion, but he isn’t the hotshot apostle yet. He is someone of whom the early church leaders were understandably suspicious. But just as Barnabas vouched for him in the early days, now he encourages him again by giving him a chance to spread his wings and develop as a leader in God’s mission. Barnabas sees that potential in Saul, and recruits him. It looks like he is spot on, given both the year that the two men spend teaching in Antioch, and of course subsequent history when Saul became Paul. The work develops – don’t just assume it’s a note of historical detail when Luke says, ‘The disciples were called Christians first at Antioch’ (verse 26). They take on a new name and a new identity. This is probably a group of Jesus followers who are a mixture of both Jews and Gentiles – remember that those who came to share the Gospel there spoke not ‘to Greeks’ but ‘to Greeks also’ (verse 20, italics mine). No longer is this merely a Jewish sect, but a group of Jews and Gentiles who, though previously enemies, have been reconciled to God and to one another through Jesus Christ. As such, they are a new entity, and they take on a new identity with a new name: ‘Christians’. It is a rôle of Christian leaders to help disciples grow into their new identity as Christ’s followers. It is a calling, if you will, to help people ‘become who they are’ – that is, to become who they are in Christ. Jesus Christ gives us a new identity when we turn our lives over to him. We become children of God, and this is not only a new individual identity, it is also a new identity as a member of God’s pilgrim people. It is not a rôle of Christian leaders to baptise every new and existing idea in the congregation. It is not part of the job description to turn up like Young Mister Grace in ‘Are You Being Served?’ saying, “You’ve all done very well” at any and every social function. It is not the rôle of church leaders to be managers of a building, but leaders of a movement. Nor is it the place of Christian leaders to be the ones who do all the witnessing and evangelising, as if that lets everyone else off the hook. It doesn’t. What, then, are the practical implications for church members here? Allow (and encourage!) your leaders to concentrate on the essential tasks of leading God’s people. Let them have resources to develop themselves and so develop others – time for reading, time to go to training courses and conferences, time for sabbaticals and retreats. Support fund-raising for world mission so that leaders can be nurtured and supplied in developing churches around the globe. Support the Methodist Fund for Training in this country to provide good quality training for ministers, Local Preachers and others. And most of all, pray for those in leadership. During my ministry, I have known of four people who have committed to pray for me every day. There may well be more than the four who have privately identified themselves to me over the years. However, two of them are now dead. Could you take it on board to pray regularly for people you know in Christian leadership? I can’t tell you what a morale-booster it is to hear that people are doing this for you. 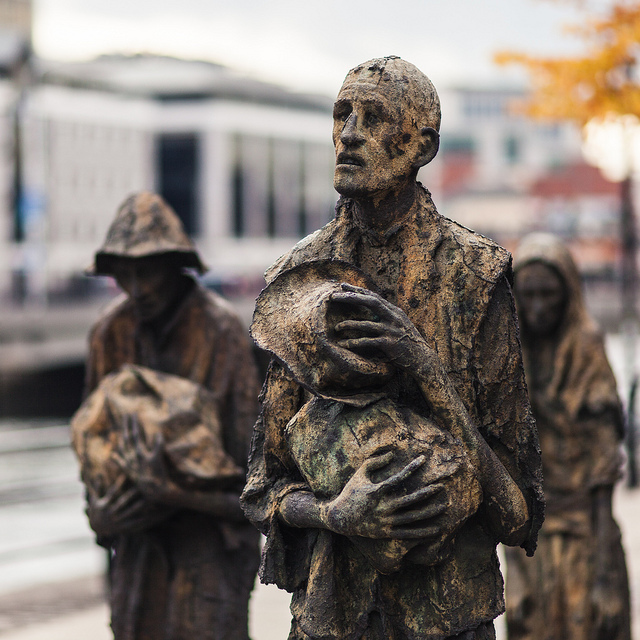 Famine Memorial by Tobias Abel on Flickr. Some rights reserved. Thirdly and finally, we move from Barnabas to Agabus. The third and final encouragement is the provision for the suffering. Agabus will turn up in one more incident later in Acts. He will have another prophetic message, when he warns Paul that suffering and imprisonment is awaiting him if he takes a particular proposed decision. He is proved right, and he is shown to be right here. We have other New Testament references to a collection for those suffering the effects of a famine, especially those in Judea. Paul’s teaching on Christian giving in 2 Corinthians 9 has this particular tragedy as its backdrop. Of course, giving to disaster relief is one expression of Christian mission with which we are sadly too familiar. We have just had plates out in recent weeks for Christian Aid’s Iraq appeal. We are used to televised appeals from the Disasters Emergency Committee. But millions of others do the same, who do not claim the name of Christ, so what could be explicitly Christian about our acts of giving for the relief of suffering? I guess there has to be a Christian dimension to the giving and a Christian dimension to the people using the gift. The Christian dimension to the giving is perhaps something we shall only know in our hearts. It is the concern to bring things in this world in alignment with heaven – ‘Your kingdom come, your will be done on earth as in heaven’. The Christian dimension expressed by the people using the gift means, I think, that we are talking about giving to organisations that act in the name of Christ. It may be those that simply are Christians who engage in disaster relief (and, perhaps, some political campaigning), such as Christian Aid. To do so may bring a visible sign of encouragement to the downtrodden. So – in conclusion, let’s go back to the beginning. I began with that slogan, ‘We know better than our pastors.’ I rather feel that what I have presented to you this morning constitutes only some very basic ideas about the place of encouragement in the development of Christian mission. Giving, supporting, encouraging, praying – there is nothing new or unusual in the applications I have suggested. Now if that’s the case, I think you can prove the virtue of ‘We know better than our pastors.’ Because you can do all of these things. And with baptised imaginations, you can dream, think, and do so much more. We haven’t even mentioned prayer, nor even the possibility of answering a call to mission ourselves. So why not get dreaming? After all, you know more than me. Posted on July 20, 2014, in Sermons and tagged Acts of the Apostles, discipleship, famine, leadership, mission, suffering. Bookmark the permalink. Leave a comment.